Three Samoan women explore the musical essence of Polynesia. Their deep respect for each other and for the music of their ancestors has brought them together to explore and create a new sound in Pacific music. Grace Vanilau voice & percussion, Natalia Mann harp, & Lila Meleisea kora (African harp), kalimba, saxophone - bring together unique instrumentation, dance and spoken word, with a whole lot of alofa (love). SUGA (sunga) came from Melbourne's Brown Roots Pacific Arts Collective over the Tasman to Pacific Undergrounds TORU Pacific Arts Festivals in Christchurch NZ, returning the following years for FA, and LIMA, and then Pasifika Festival in Auckland. They were handpicked for the Femme Funk Festival in 2004, and toured New Caledonia, collaborating with local artists Patrice Kaikilekofe and Ela To’omaga. They were the buzz word at the Australian National Folk Festival, sharing the stage with legendary blues guitarist Bob Brozman, and taking away a performance excellence award. They have double billed with legendary Indigenous artist Archie Roach, and supported Zimbabwe’s Queen of Mbira, Stella Chiweshe. The Melbourne International Festival of the Arts saw them backed by the three hundred strong Boite choir, and performing with Christchurch based group Triballincs. They performed at the NZ Harp Conference 2005, represented at the South Project, a gathering of artists from across the Southern Hemisphere and for Film NZ at the Cannes Film Festival in France. SUGA came together again in 2013 to continue the journey, performing at the First Melbourne Pacific Contemporary Arts Festival and Seven Sisters Festival. In 2014 they collaborated with Samoan dance group Aniva for the World Harp Congress Sydney 2014, creating a powerful new dynamic weaving together oratory, dance, rhythm, sound & song. The result is contemporary, healing and uplifting. All aboard as trio Suga embarks on a musical voyage. Felolini Maria Ifopo goes along for the ride. Already the crowd is anxious to hear the next act. They’ve spied the ethnic instruments and the funky-looking harp. Curiosity peaked; they desire a new musical journey. Suga is not so much a turbo-jet ride of frenetic musical beats. It’s more like a breezy getaway of intricate rhythms and melodies from the Pacific. It’s a bit of a trip for a Christchurch audience at the Dux de Lux on a Wednesday night. When they do start to play, it is clear these three Samoans are sassy, chilled-out mamas. 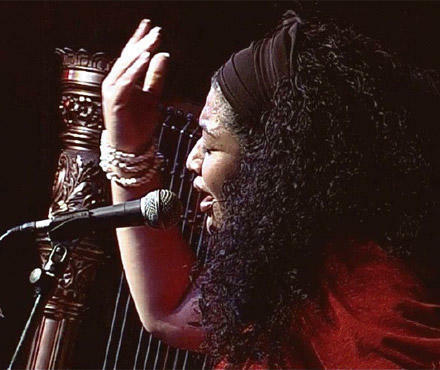 Serene and composed, Natalia Mann readies her harp for the performance but illusions of passive classical music are immediately shattered as she beats and plucks her way through Suga’s take on the Samoan standard, E Malie, E Tagifa. Her staccato style ignites images of warm seas lapping at the coral beaches of the South Pacific. If all you needed then was a breeze to take the edge off a humid day, then your answer may lie with Lila Meleisea as the gentle notes of her saxophone exhales through the Dux. For a change of pace, Lila will play the kalimba (African thumb piano) and kora (West African harp) that sit patiently by her side. And perched in the middle is Grace Vanilau. Grace by name and by nature. Her voice is like mellow, full-bodied and resonates with delicious tones, rich spice and flashes of sweetness. As the lead singer, she doesn’t try and overpower the instruments. She flows with them. In confirmation of all that is happening on stage, the audience is sea of nodding heads as they groove in agreement. Speaking afterwards, the Australia-based trio explains their origins. Grace and Natalia met in Christchurch and then again later at a Melbourne barbecue organised to set up the Brown Roots Collective for Pacific artists. From there, Sunga formed as a house band to fill in the gaps for a Pacific show. Natalia then met Lila in Tasmania, where she grew up and now teaches music. Now the women meet as often as possible to collaborate and perform. 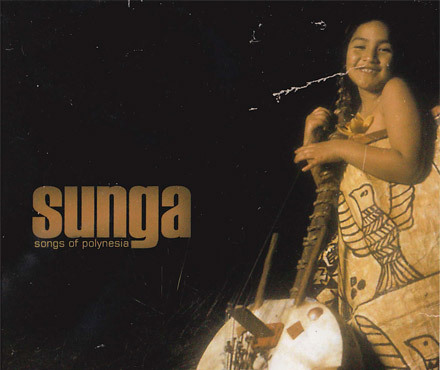 Performance is a large part of Suga as they seek to represent a strong image of Polynesian women. The annual Pacific Arts Festival in Christchurch is a regular gig on their calendar and the group regularly travels to gigs around Australia, New Zealand and the Islands, including Kanaky. So for now Suga will continue their journey of relaxed Island music. Catch them if you can.